Anyway. 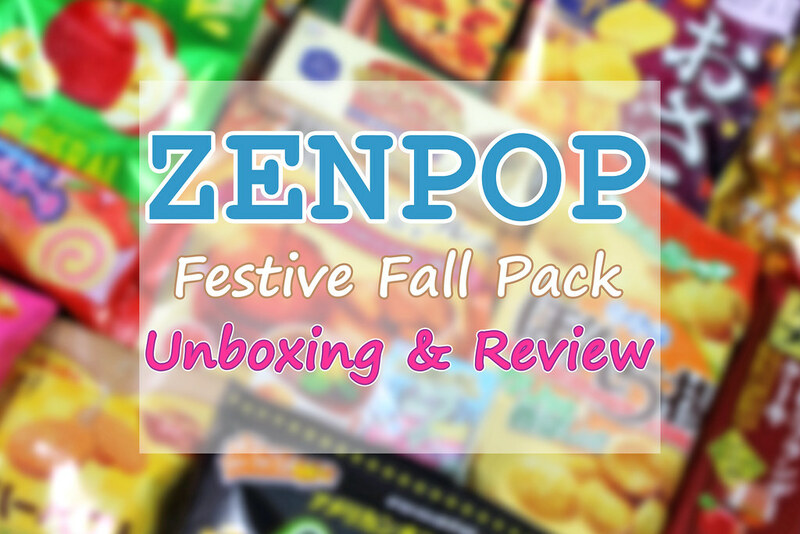 Today I’m going to be writing about the fantastic Festive Fall Sweets Pack from Zenpop. 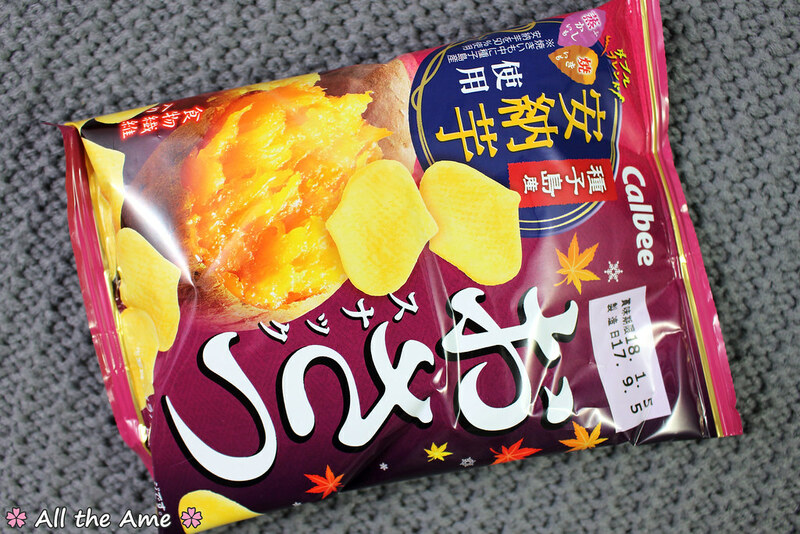 I love fall flavours so you can bet I was excited to see a pack dedicated to them! This pack was released in September 2017, to see the current Sweets Pack theme click here . Without the dip, they’re your standard plain salty corn chip. 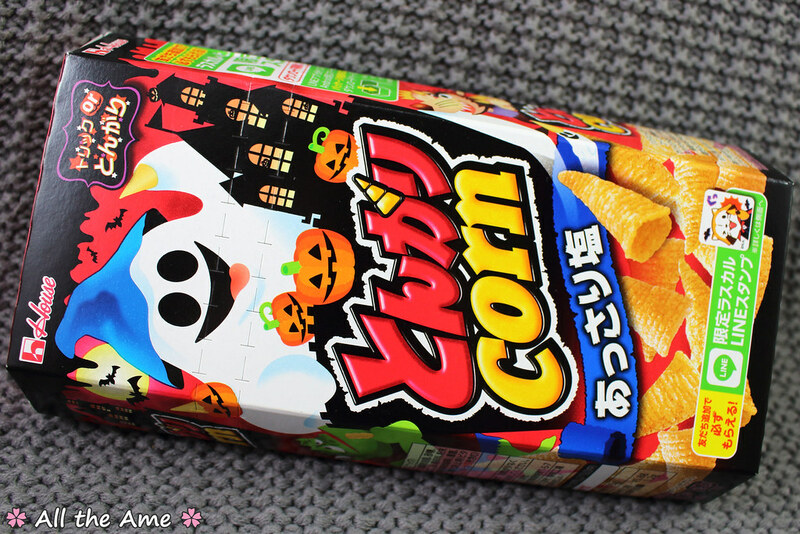 I can’t say these were my favourite snack in the box purely because I’m not so fond of salted corn chips, but it’s a massive pack to share, the Halloween packaging is fun (there’s even a cut out mask on the back of the pack) and my son loved them. He’d give them a 7/10, rising to a 10/10 if you include the ketchup! 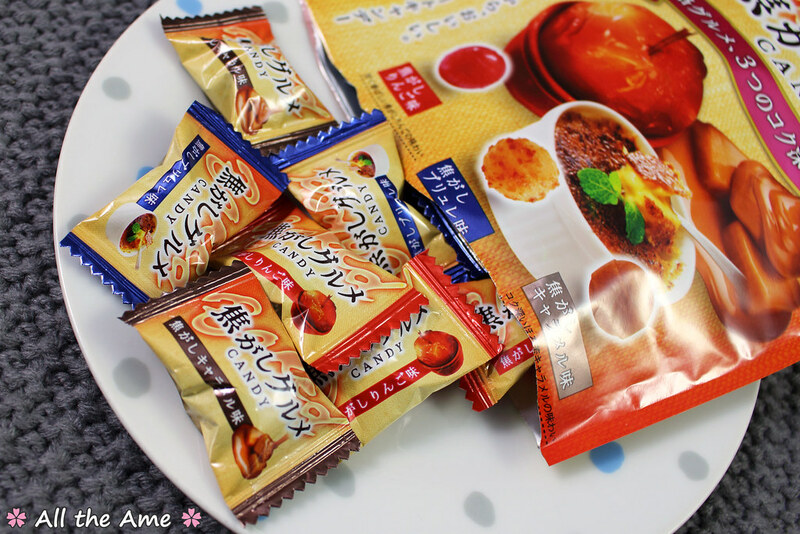 Creme brulee- what an odd looking candy! It looks like someone has taken a blow torch and caramelized the outside of the candy, just like they do on the top of a real creme brulee. 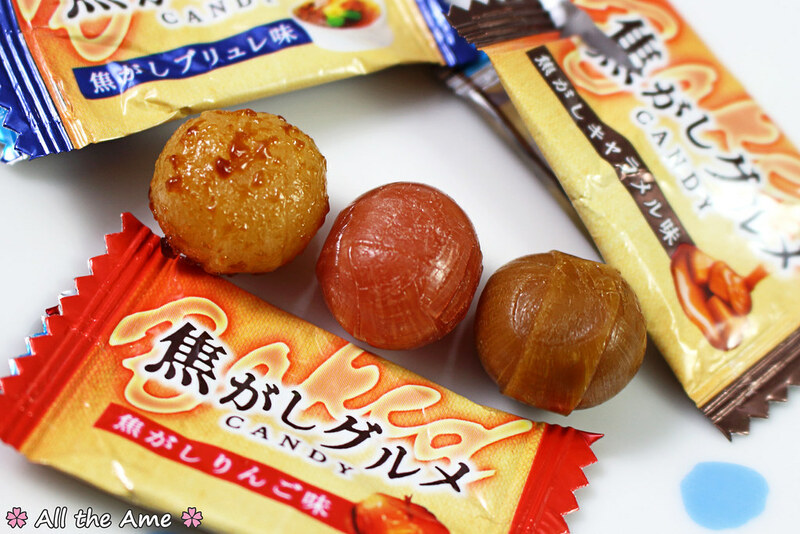 Beyond resembling the dessert, these candies taste just like it too; the nobly outer layer tastes just like the caramelized brown sugar topping, while the smooth candy inside has a creamy vanilla custard flavour. I love that the two layered effect of the real dessert has been recreated so faithfully in candy form! 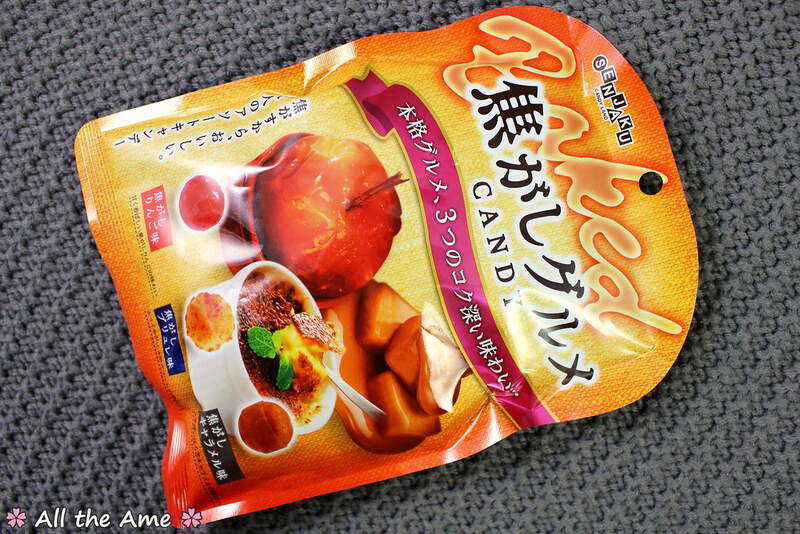 Candied apple- another duel flavored treat, you can taste both sweet apple and the super sweet crunchy red candy coating. It’s surreal! I love toffee apples, sadly I missed out on getting any real toffee apples last Halloween but these candies made up for it! Roasted caramel- the most simple of the flavours, this one tastes like a smooth and creamy roast caramel sauce. What can I say, these are fantastic! They certainly live up to the ‘gourmet’ title with their true to life, restaurant quality dessert flavours. A 10/10 for sure! Such cute little cookies! 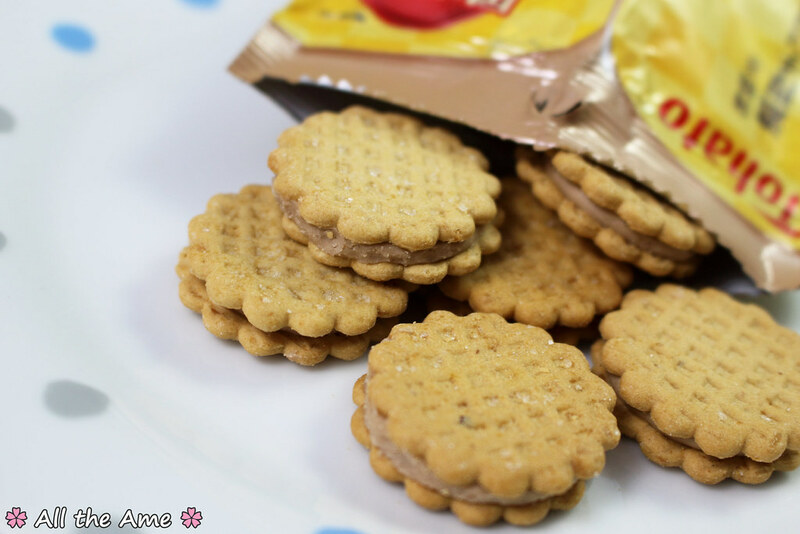 They don’t disappoint taste wise, the creamy chestnut flavour comes through brilliantly with just enough sweetness in the biscuits to balance it out. 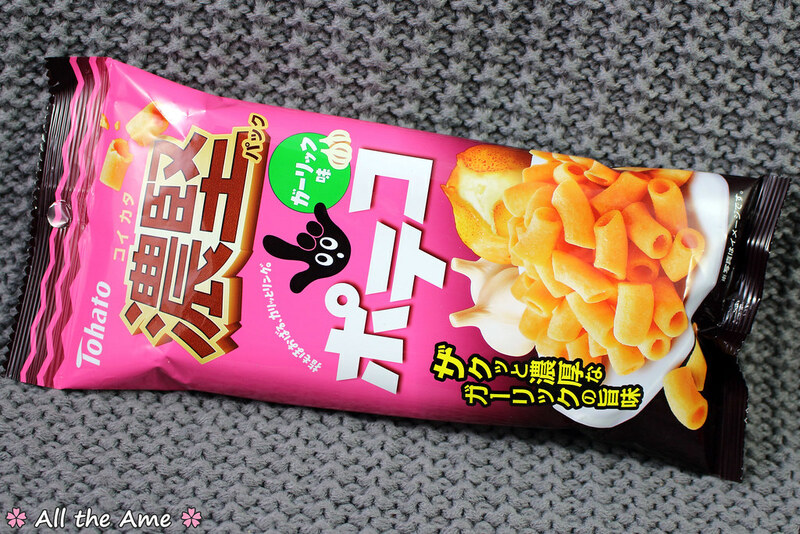 Quite a mild flavour overall, this would be a great one to try if you’ve never had chestnut flavoured snacks before. 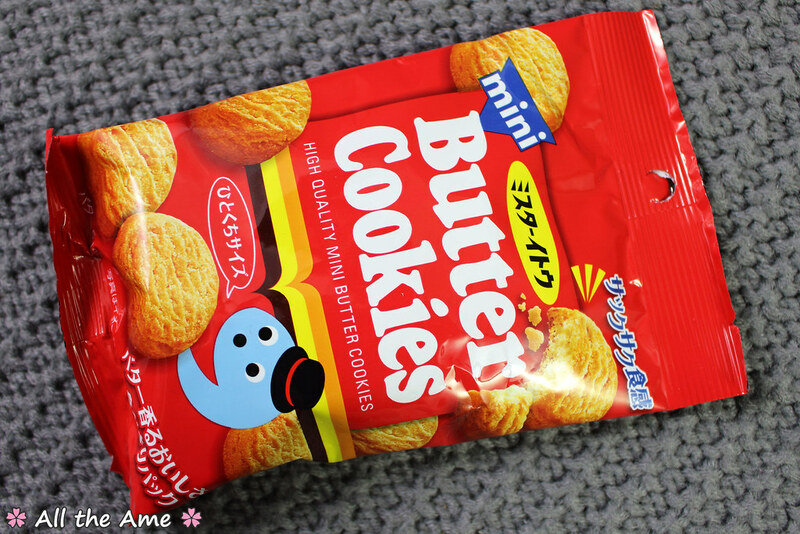 Another 10/10, I don’t think there’s a flavour of these cookies I don’t like but these ones are particularly delicious! I may not have had a blooming onion but I have had tobacco onions and to me that’s just what these taste like, well seasoned crispy fried onions with a hint of sour cream in the background to freshen the flavour up a bit. 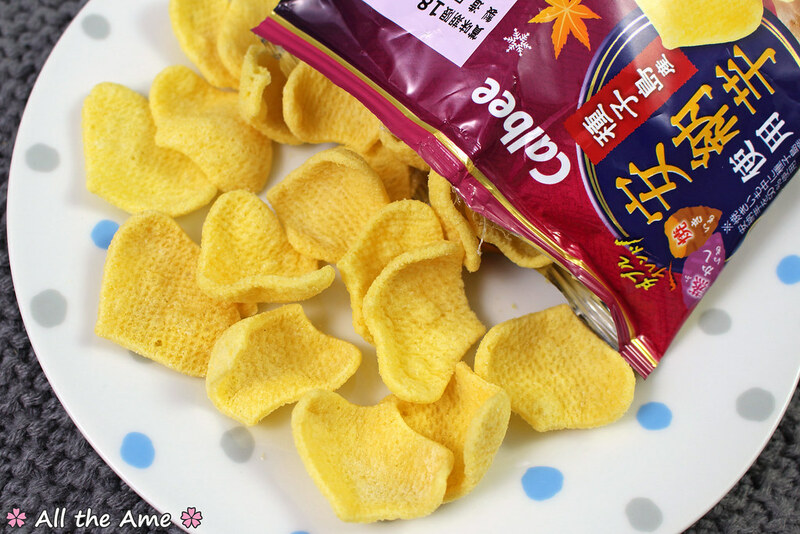 They’re nice and crunchy and the flower shape is fun, although it makes it tricky to lift just one out of the bag as they grab onto each other. 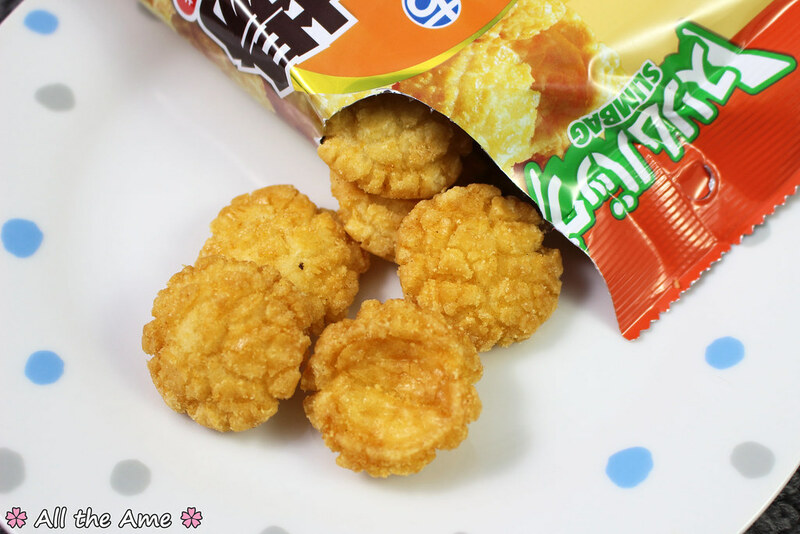 Zenpop say people in Japan thought these looked like jellyfish, how adorable! I can totally see the resemblance. These get a 10/10 from me, the flavour of fried onions is hard to beat whatever form it takes. Check out that cheesy filling! These get a big 10/10 from me, I couldn’t stop eating them. 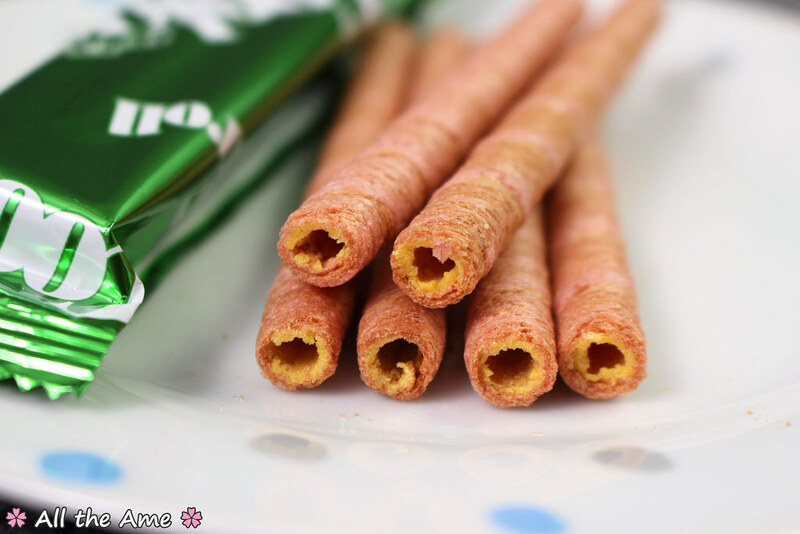 They remind me of the rolled chocolate wafers you get for ice cream, only pizza flavoured. 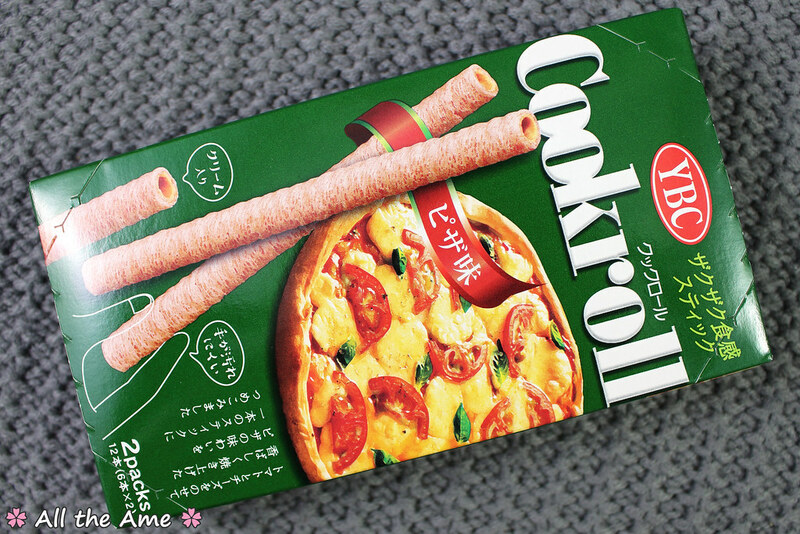 May sound weird but trust me, if you like crispy snacks and you like pizza you’ll love these! Did you know I really, really like cube shaped candies? I don’t know what it is but they really appeal to me. 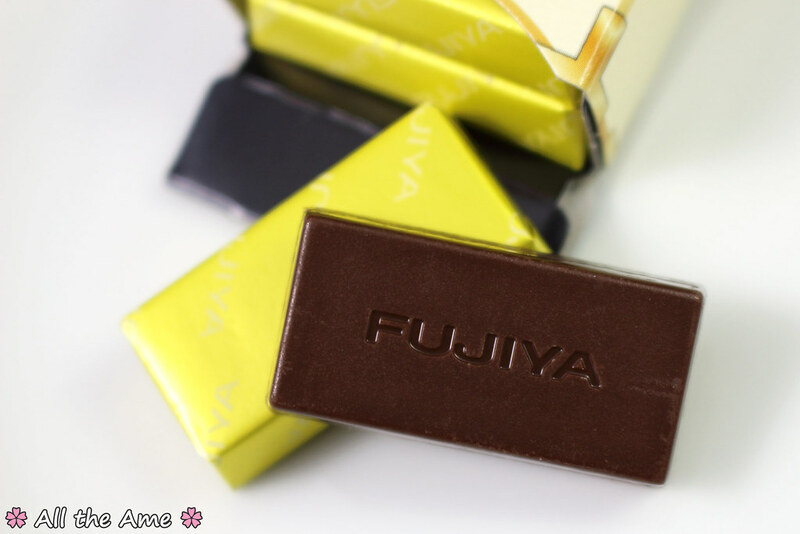 These ones are made up of a combination of jelly and soft candy to give a unique texture with a Fuji apple flavour. 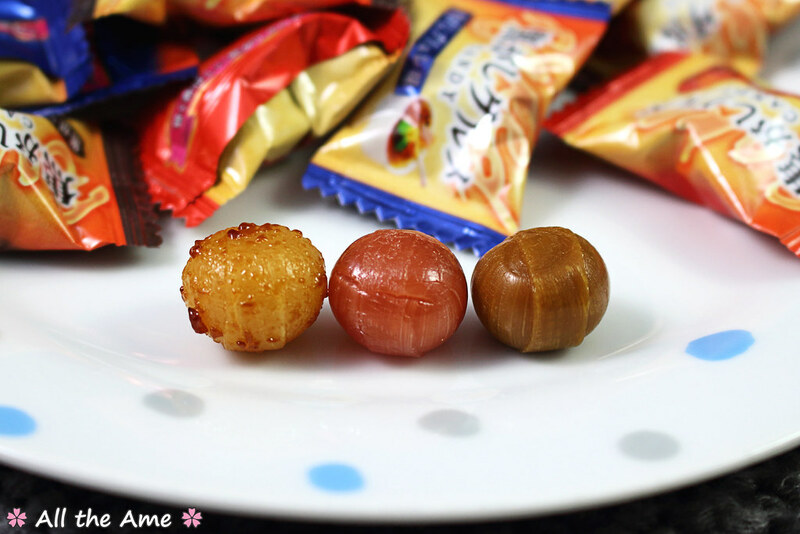 The texture of these candies is tricky to describe. They’ve been designed to recreate the texture of a Fuji apple and you know what, they really do. The white part is firm and crisp, almost powdery, just like when you bite into an apple. It even makes the same noise as biting into a real apple! 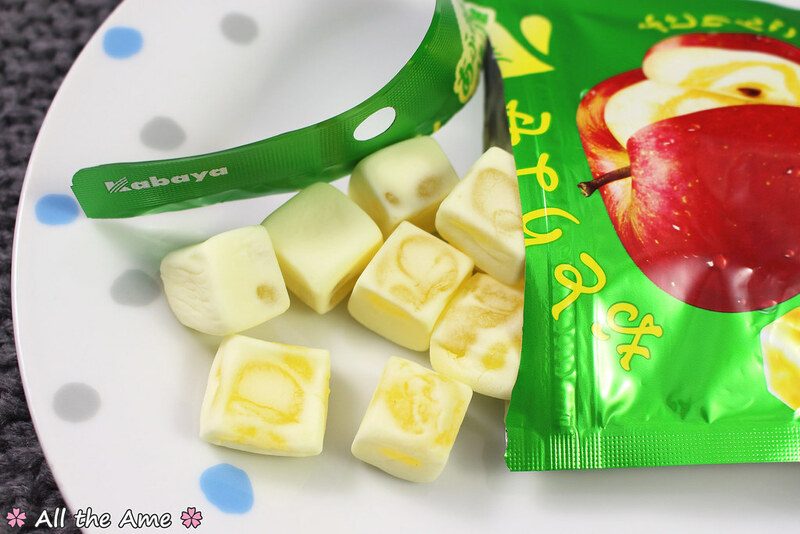 The jelly part is super juicy and adds a sharper apple taste on top of the sweet, mild apple flavouring in the white part. It’s bizarre! 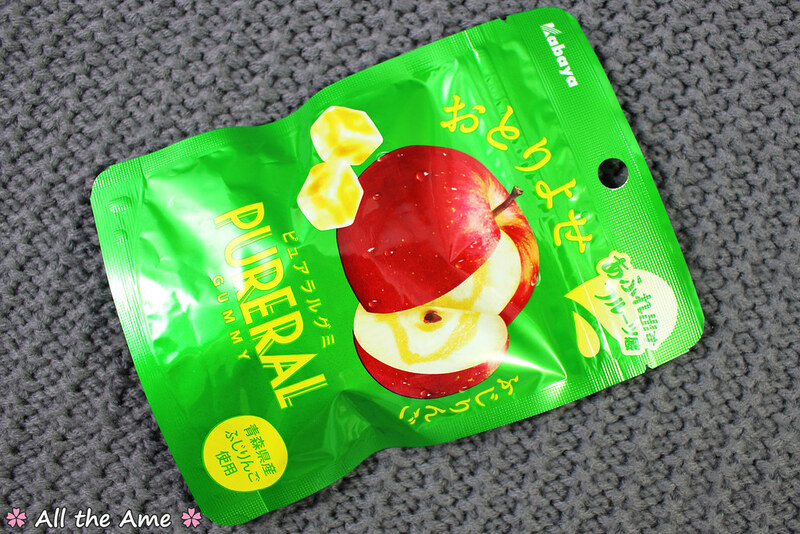 These have to be the most strangely realistic apple candies I’ve tried. 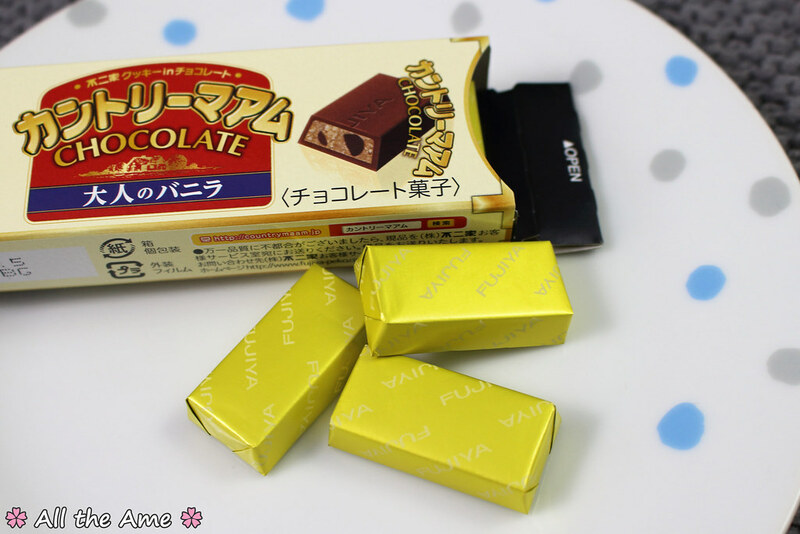 I’m used to realistic flavours from Japanese candy, but when the texture is so like the real thing too? It’s weird, but it’s wonderful. These get a 10/10 from me, they’re about as close to eating an apple as you can get short of just eating an apple. Well worth a try just for the unique texture! Please tell me somebody else thinks of PPAP when they see this packaging. Anyone? Okay, moving on. 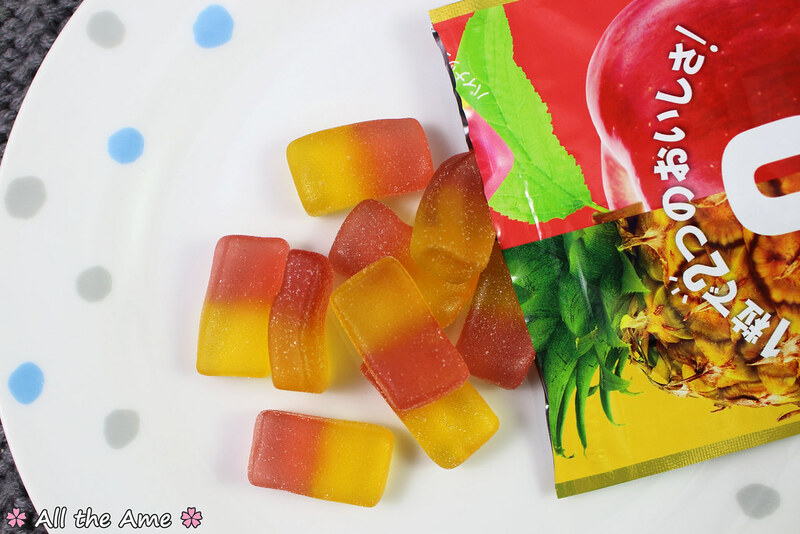 These gummies feature two flavours in one gummy, the red part is apple flavour and the yellow is pineapple. 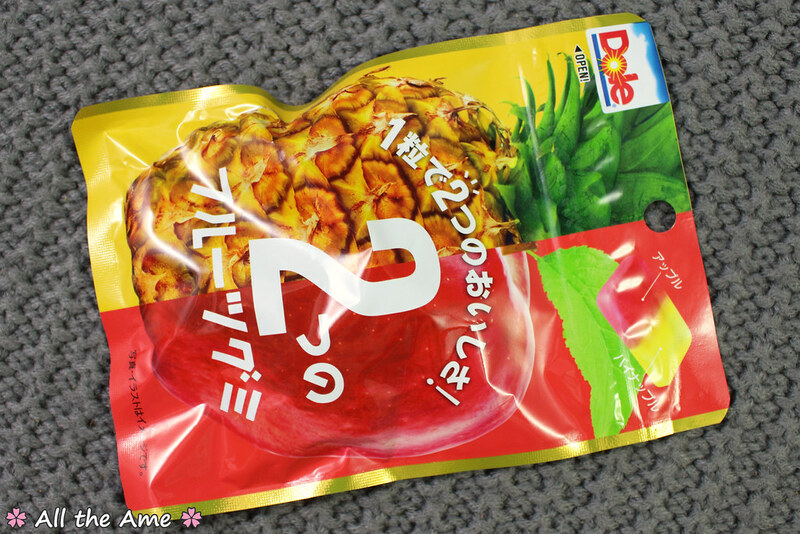 The gummies are tough and chewy, but to me the individual flavours of apple and pineapple just don’t come through and they taste a bit watered down. Reminds me of the Dole fruit and jelly pots you can buy here in the UK. They’re not terrible or anything, I guess I was just expecting more than a generic sweet fruity flavour. My expectations are pretty high when it comes to Japanese gummies after all! These get an 8/10 from me, not quite the high quality flavour I expect from Japanese gummies but still a tasty treat. Calvados, I have learned, is an apple brandy from France. I was wary when I figured that out as I’m really not a fan of alcohol in desserts (or alcohol at all to be honest! 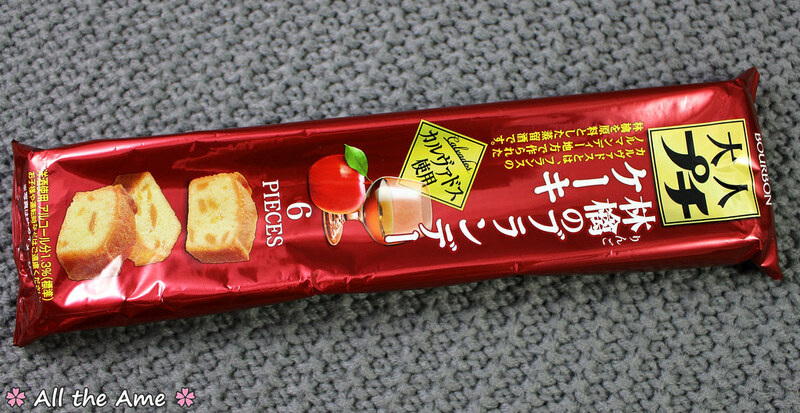 ), but thankfully these delightful little cakes are far more apple than brandy and don’t have that nasty alcoholic taste. Aren’t they adorable? You get six slices of cake in the pack, which is enough as it’s a fairly rich treat. The cake itself is super moist and has a nice springy texture, you really wouldn’t know it came pre-packaged. 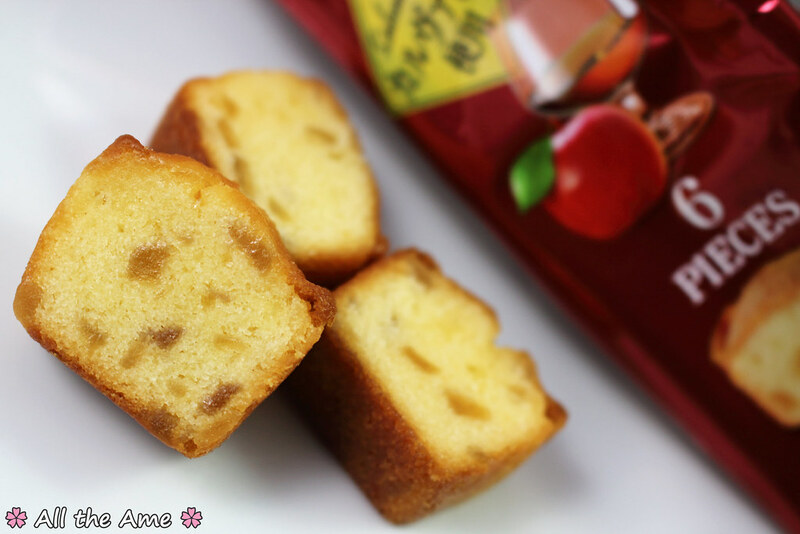 The sweet apple flavour is fantastic, with the brandy flavour coming through as a deep, rich but subtle undertone that makes these feel quite grown up and decadent as slices of apple cake go. The texture is light and airy and the flavour is sooo delicious, it’s like eating a perfectly baked, perfectly seasoned sweet potato. Sweet, slightly salty. Yum! Yay, more cookies! I have a weakness for biscuits of all kind, haha. 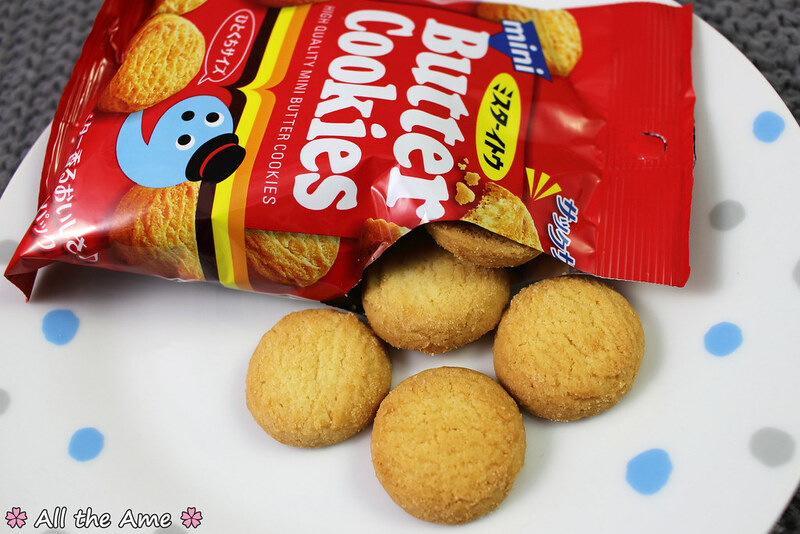 After trying the more unique chestnut cookies, these butter cookies offer a more simple and familiar flavour. The cookies are chunky and bitesized, with a crumbly texture and a fantastically buttery flavour. They’re closer to shortbread than cookies to me. There’s not really a whole lot else to say to be honest, they’re just a good honest tasty snack and another firm 10/10, would munch again! 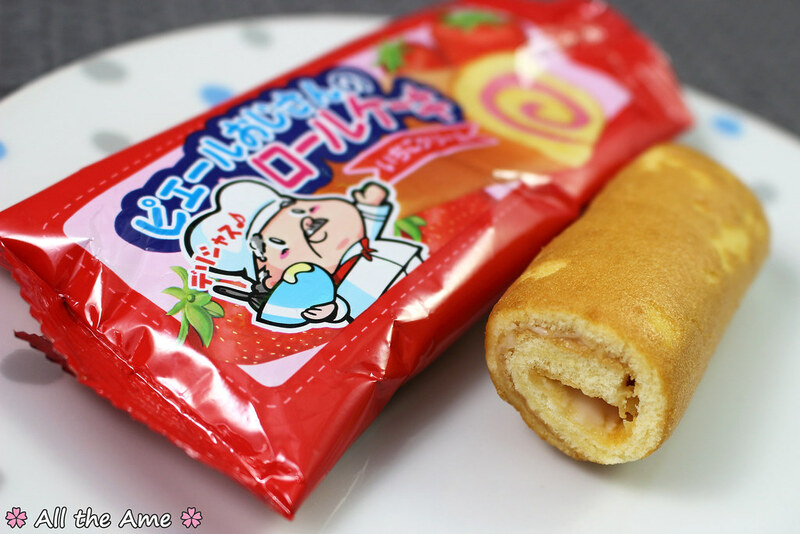 Again there’s not much to say about this one, strawberry flavoured mini swiss rolls aren’t exclusive to Japan so I daresay most of you reading have tried one before. 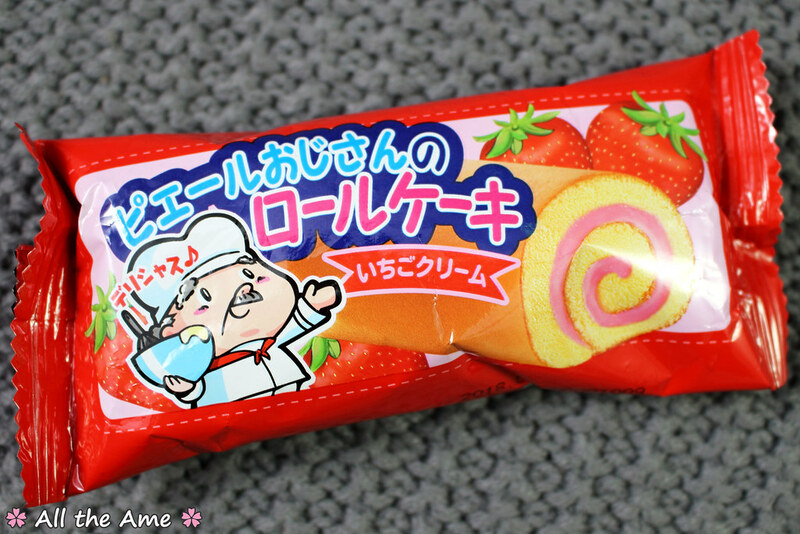 The sponge is fluffy and moist and there’s a good amount of sweet strawberry cream inside. For a prepacked cake it’s really good! 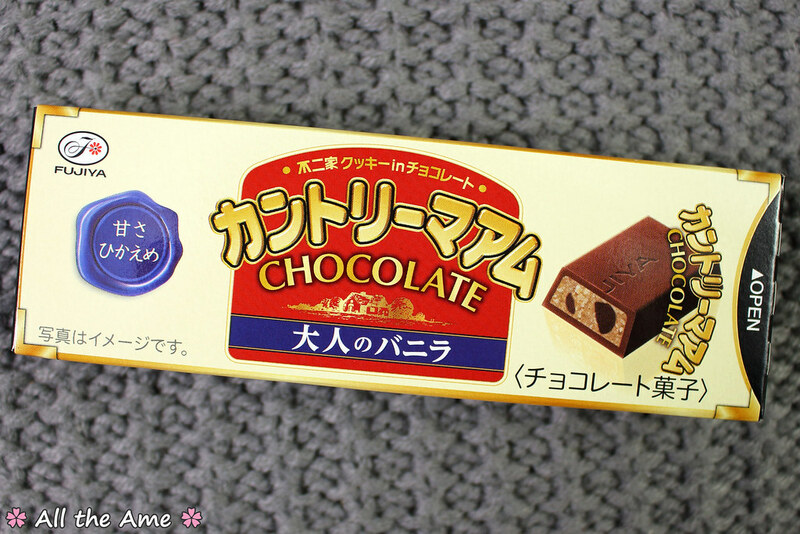 It’s one of the better quality dagashi I’ve had so I don’t mind getting it multiple times quite so much, although after the one time we got a custard flavoured one I do wonder what other varieties this roll cake comes in? Maybe someday I’ll find out! 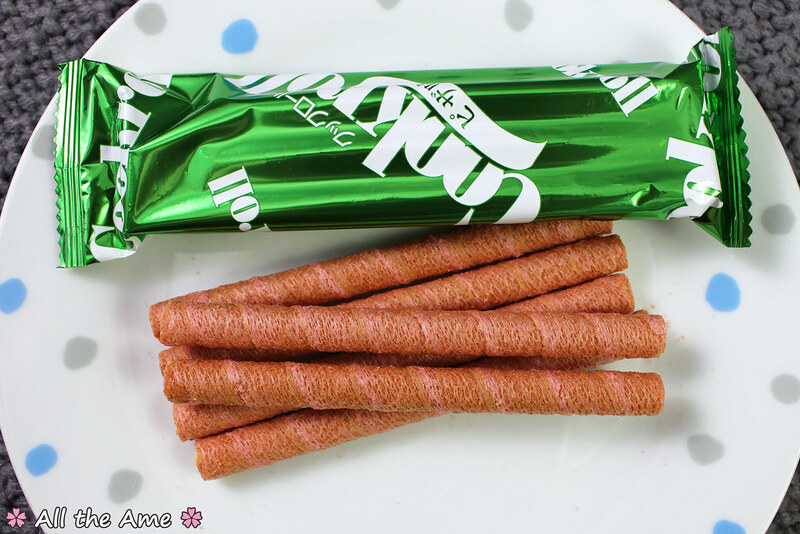 This one gets a 9/10, you can pick up similar cakes in any UK supermarket (especially in the super common strawberry flavour) so it’s not the most exciting inclusion in a Japanese snack box but hey, it’s a tasty little snack nonetheless (‘little’ being the operative word!). 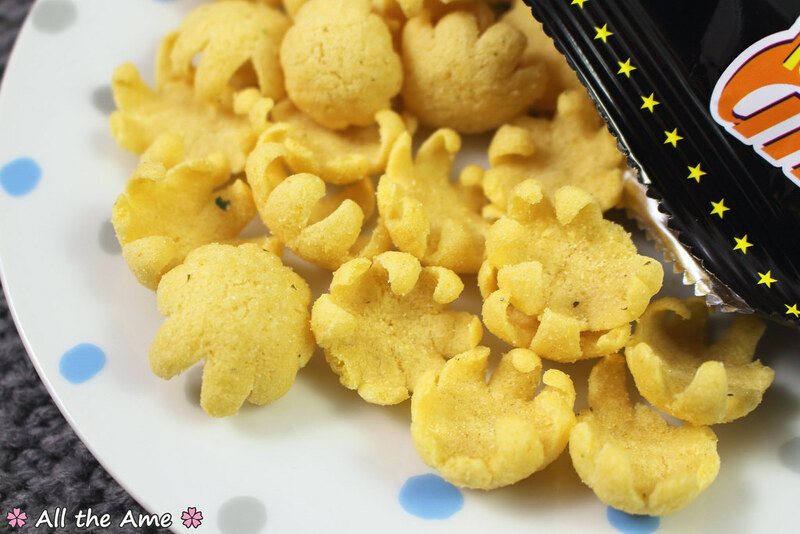 These bite sized senbei are everything I love in a rice cracker; a light and super crunchy texture and a delicious glaze, in this case a perfect balance of salty and sweet flavours. There are lots in the bag too so you can keep munching for ages. 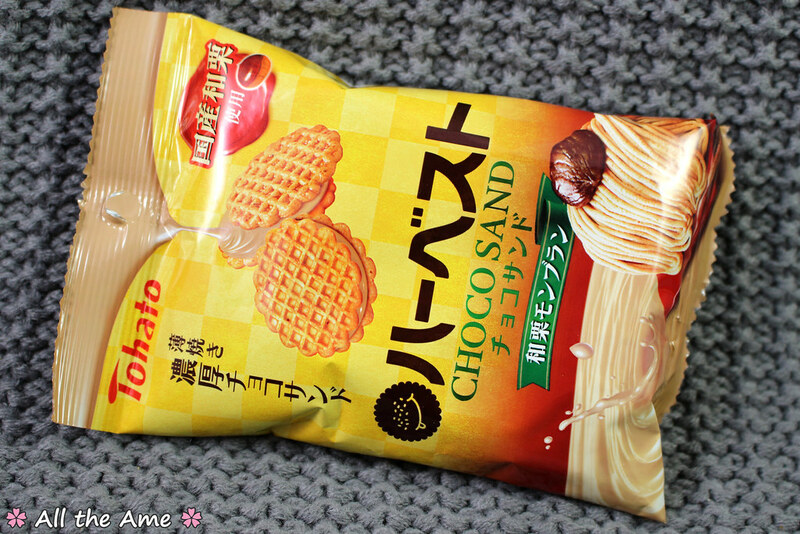 Country Ma’am cookies are some of the best Japanese cookies I’ve tried, so I was really excited to see these chocolates with their crushed cookie and chocolate chip filling. This is one of the items I was looking forward to most actually! The filling is delicious and to me tastes more like raw cookie dough than cookies, an odd distinction to make perhaps but hopefully enough of you have eaten raw cookie dough to understand what I mean! 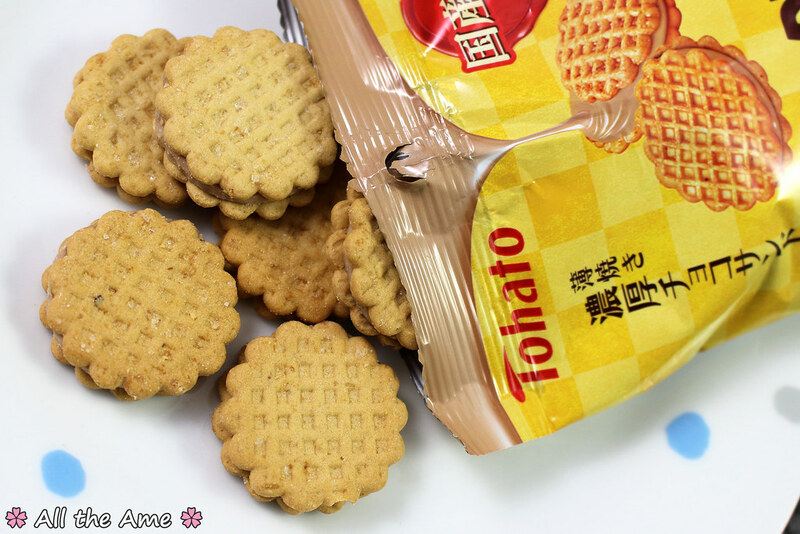 The cookie filling is very rich and very, very sweet, with quite a hit of vanilla. Both the chocolate coating and the chocolate chips inside are bitter enough to offset the filling and stops the overall flavour becoming being sickly sweet. 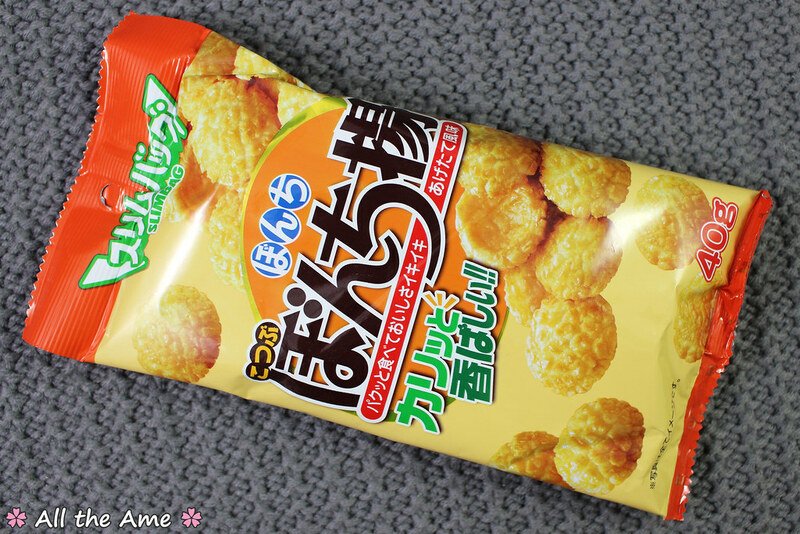 Tohato aren’t just good for Caramel Corn, they make damn good potato snacks too! These ones have a garlic flavour, yum! 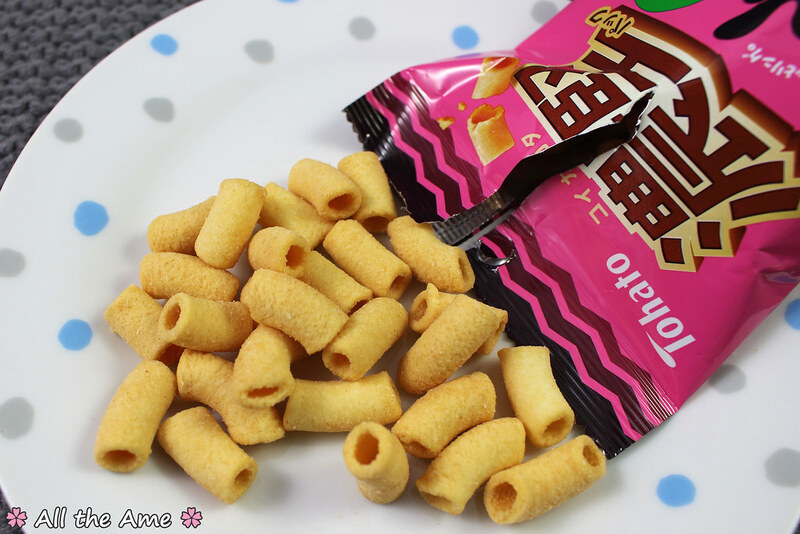 The potato hoops are super crunchy, they remind me of Hula Hoops. 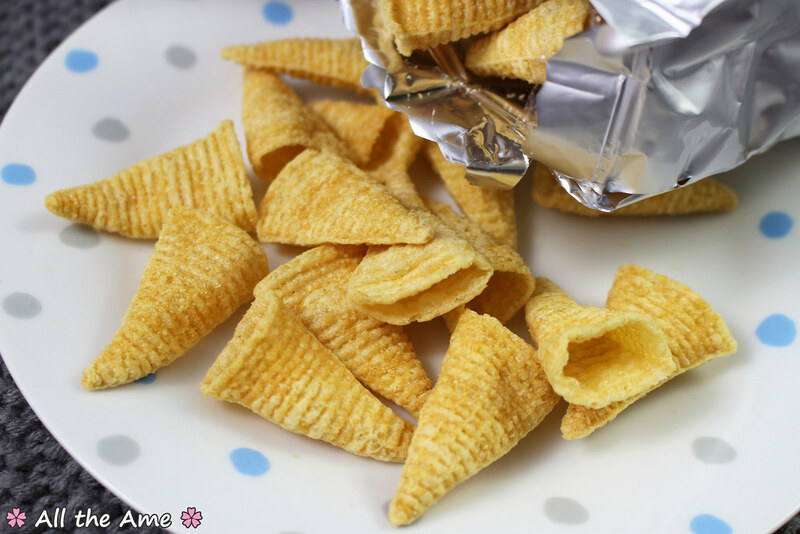 To me they taste just like the original salted variety of Hula Hoops (a very mild salted flavour), with the garlic flavour coming through almost as an aftertaste that gets stronger the more hoops you eat. 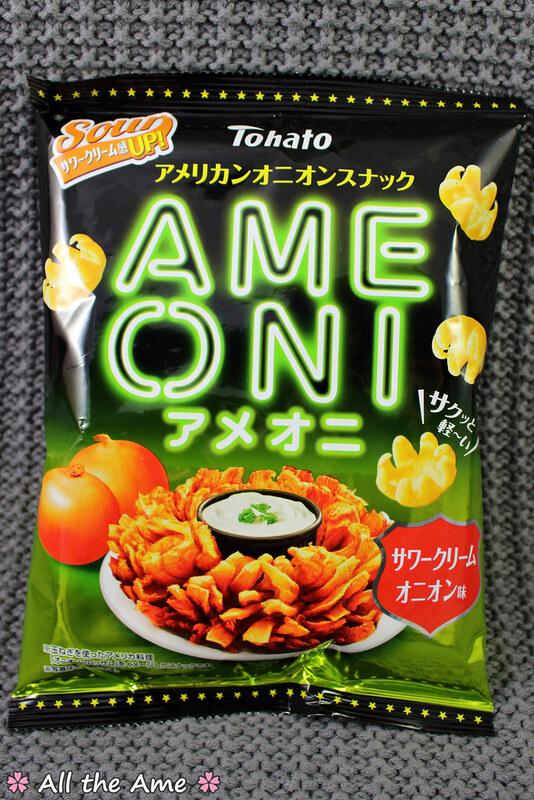 I love garlic but I know some people find the smell/taste too strong, I think Tohato have done a really good job making these just flavoured enough that they aren’t overpowering while still having enough delicious garlic flavour to satisfy garlic lovers like me. 10/10, and bonus points for making me laugh with the funny vampire reference included in the leaflet! 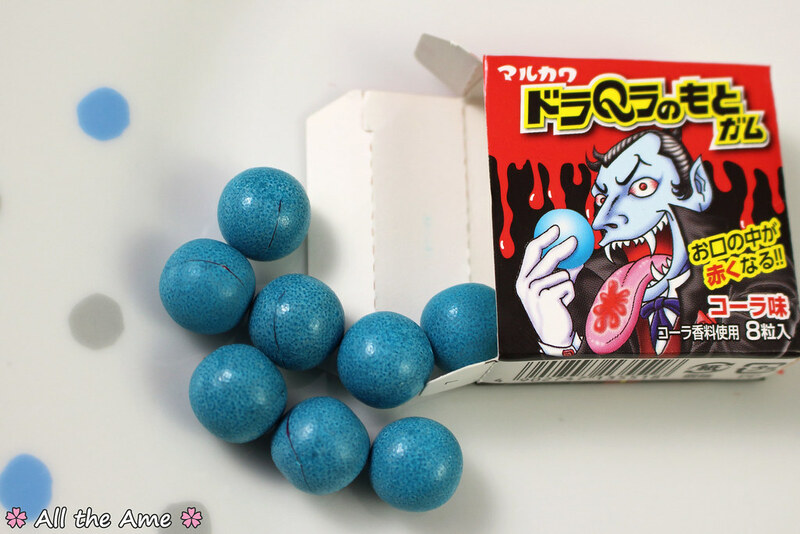 The gum is actually pretty horrifying in action, I couldn’t get a good photo of it but the gum is blood red inside that blue shell and once you bite into it, it looks like you’re bleeding. Minorly disconcerting but definitely effective if you want to look like a vampire! It does indeed turn your tongue a very convincing shade of I-just-sucked-your-blood red and the cola flavour is really good. This one gets a 10/10 both for the great taste and the hilarious tongue transformation. The quirky, fun side of Japanese food. Where travel and poetry intertwine.